Homemade Sauerkraut... definitely the best type of fermented food to start with when learning how to ferment at home. Sauerkraut is particularly easy for a first fermentation project because cabbage ferments extremely well. The water content along with the microbial species richness of cabbage make it optimal for wild fermentation! With this recipe you'll learn how to make the best, most probiotic homemade sauerkraut in a mason jar. If you're a visual learner there is also a picture guide below the recipe! For more information on fermentation and gut health vocabulary visit our Gut Health 101 Blog & our How Do You Make Fermented Foods Blog. I love sauerkraut. I have a special relationship with sauerkraut because it was the first fermented vegetable I ever made! The first time I made sauerkraut it was part of a class project in Advanced Microbiology Lab at Louisiana State University. I'm actually really lucky because this was also the first time I ever tried sauerkraut. I was never subjected to the subpar stuff, I've only ever eaten sauerkraut focused precisely on the microbes that ferment the cabbage into a preserved superfood. We made our sauerkraut by using a safe, proper salt concentration of about 2.4-2.5% and we allowed it to ferment for about 4 weeks. Throughout the fermentation process we got to study the progress of it microscopically and by monitoring pH levels (obviously this is when I fell in love with fermented foods). I already loved microbiology, and I was beginning to explore food as medicine. All I could think about during this section of my class was getting my own microscope and fermenting everything, all the time at home. And well... that's exactly what I ended up doing. If you read this Dr. Karen Sullivan: Just know, your class changed my life and I'm forever grateful that you were my teacher. I became an undergraduate teaching assistant for this class for three semesters... and when you teach a subject, now that's when you truly learn about it. I learned so much every time a student would ask me a question, even if I didn't know the answer... I learned more too. My time spent as a student and a teaching assistant in this class fostered my love of the natural microbial world. It opened up an entire new view of the world for me. I now see the whole world through a filter of my passion: microbiology. When I view the world, I can tie basically anything in life back to microbes, and I love it. I love nature, I love the natural ecology of the world, I love microbiology and the wonder and power of microbes, and I love real food... That's why I'm here, doing this. I was able to utilize what I learned while pursuing my degree in Microbiology to innovate, to ferment on a large scale, to develop the best method for fermenting vegetables in huge wooden barrels, to apply the skills I learned and develop recipes for many types of vegetables. Oh gosh, I just love it. If you're going to master fermentation you'll need to use weight measurements for your fermentation ingredients. That means you need a kitchen scale. In order to select for the best probiotic bacteria (the ones that are actually beneficial) in your ferments, you must weigh salt to create a specific salt concentration. Weighing salt is the only way to create a salt concentration that will select for only probiotic microbes to thrive. You can read more about why you must weigh your salt & how to calculate salt concentration here. In this recipe we are adding 2.5% salt (that means we are adding 2.5% of the cabbage + water weight in salt → i.e. 2.5% x 400 grams = 10 grams. So we are adding 10 grams of salt to give us a 2.44% total salt concentration). This is the scale we use in our home kitchen to weigh salt. Pro tip: when we are weighing out small amounts of salt, we like to use the fermentation salt lid as weighing tray! Takes 30 minutes prep and 3-4 weeks fermentation. Yields one 16 oz Jar. Remove the outer leaves of your cabbage and lightly rinse with cool water. Using a knife, chop the cabbage to your desired thickness. Place your kitchen scale on the counter. Turn it on and set it to weigh in grams. Place a mixing bowl on your kitchen scale and tare/zero the scale. Note: Taring/zeroing the scale with a container on it subtracts the weight of the container, allowing you to weigh only what is added to the container. After taring/zeroing the scale, the scale should read 0.0 with the container on it. Add chopped cabbage into the bowl on your scale until the scale reads 300 grams. Remove the bowl of cabbage from the scale and set aside. Place a small, empty bowl on your scale and tare/zero the scale. Weigh out 10 grams of salt. Add the 10 grams of salt into the bowl with the cabbage, and mix with your clean hands until the cabbage becomes wet. This usually takes about 5 minutes. Place your empty, clean mason jar on the scale, and tare/zero the scale. Make sure your scale is still set to grams and add 100 grams of filtered water to your mason jar. Add the 100 grams of water into the bowl with the cabbage and salt. Add the caraway seeds (optional). Mix everything well. Starting with the liquid, add the entire contents of the bowl into your mason jar, and pack everything down using a tamper, wooden spoon, or your hand. 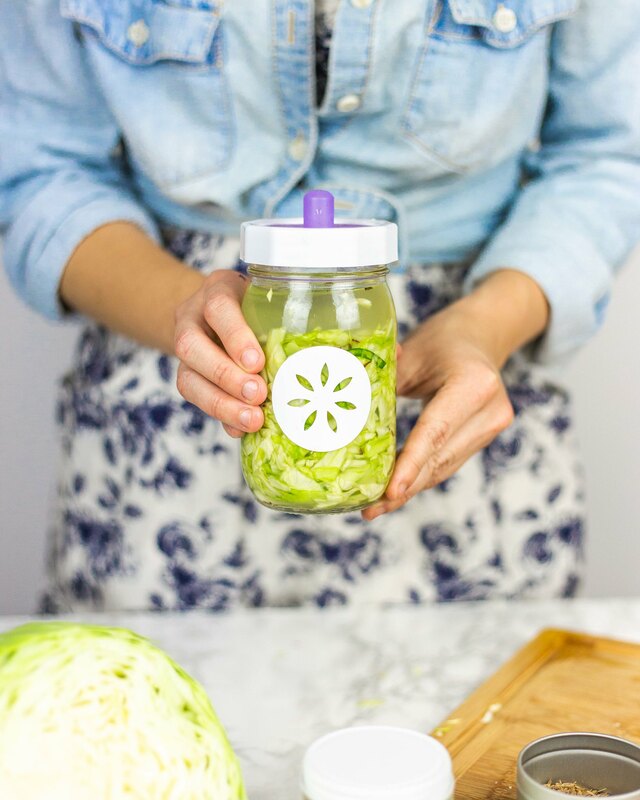 Place your glass fermentation weight in the jar, making sure to submerge the cabbage pieces and weight fully into the liquid. Secure the standard mason jar lid, or your airlock lid to the mason jar. During the first few days of fermentation: carbon dioxide and bubbles will be produced. Sometimes Jars will become very full with liquid, and this liquid can seep out. If using a standard mason jar lid: remove the lid and tamper everything back down using a gloved hand, tamper or spoon. Make sure everything, including the weight is still submerged below the brine. If using a silicone airlock lid: If liquid comes out of the top of the lid, you can remove the lid and tamper everything back down, or you can leave the lid on and just rinse the top off in the sink. Always Trust your sense of smell: Fermented cabbage should smell pleasantly sour and like strong cabbage. Never eat anything that smells repulsive or yeasty. Never eat anything that had mold growing on it: By following directions you should not encounter this problem. Taste test at three weeks: If you prefer the sauerkraut to be more tart and sour, let it ferment for four weeks. What Temperature Should I Keep My Fermented Foods At? How Long Should I Ferment My Homemade Sauerkraut? After 3-4 weeks minimum, remove the fermentation weight and smell and taste test. Your fermented cabbage should smell pleasantly sour. It should taste tart, lightly salty and cabbagey. After fermenting for 3-4 weeks, remove the weight and place a regular mason jar lid on the jar and refrigerate. Consume within 6 months for full probiotic benefits. We tracked our kraut throughout the fermentation process. By checking the progress of microbial stages under the microscope we have provided you with this handy timeline! If you follow our recipe and directions, your timeline of sauerkraut fermentation should approximately match ours! 24 - 48 hours: All contents in the jar should be submerged beneath the brine. At this time there are still Gram negative bacteria and possible pathogens present. 48 hours - 5 days: After 48 hours you should start to see lots of bubbles being produced. This is when the ferment enters stage two of vegetable fermentation. Leuconostoc bacteria begin to thrive and Gram negative organisms die off. 5 - 10 days: The bubbles in the brine will decrease, as the ferment leaves stage two and enters stage three. The ferment will become cloudy, the color will change and a pleasant sour smell will develop. Lactobacillus species begin to thrive this time period. 10 - 21 days: Lactobacillus make up majority or all of the microbial population. They produce copious amounts of lactic acid, and make the ferment smell even more pleasantly sour. This is the time in which the vegetable mixture becomes sauerkraut and is preserved. 21 - 28 days: This is when you want to smell and taste test. Wait for the kraut to smell and taste as you like, and refrigerate when you find the smell and taste most pleasant! We like ours best when we refrigerate at about 25 days.